This section contains details on each of the Storyline missions in the game. Once you have finished the first storyline mission, these will be sent to you automatically during the game. Every time you finish one of these missions, you will get a badge in you Status screen representing the mission. The storyline starts at about April 14th 2010 when the top Uplink Agent (deceased) sends you an email. In this mail will be a link to ARC Central Mainframe, along with his user name and password. 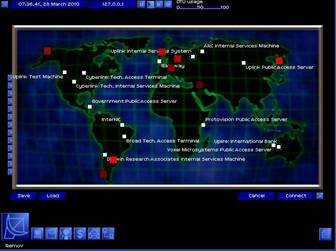 In order to enter the storyline, you must connect to ARC Central Mainframe, and try to hack the system using the Codes that the Agent sent you. The codes wont work, but the act of trying alerts ARC to your presence. Before you do this, make sure you have at least 4Gq of memory space left, or you wont get the file that ARC send you when they contact you. A week or two later, ARC will send you an email offering you a job. Accept this and the storyline begins. You will get these missions if you accept Arunmor's proposal when it is offered to you after ARC ask you to destroy Arunmor's system. Finish Special Missions, and get little awards. Description: After accepting the offer from ARC, wait for Arunmor to give you a counter-offer. Reply to the mail they send you, with Revelation attached, and they will give you 15000c. After completing this mission, you will be on the Arunmor side of the storyline. Mission Description: Upload and run a file. Description: First, connect to the Arunmor File Server, and copy the RevelationTracer to your memory. Next, connect to ARC Internal Services Machine, and bypass all the Monitor, Proxy and Firewall. Break the password and enter the File Server. Run your file copier on the RevelationTracer, then copy it to the File Server, then go to the Console. Enter the usr directory (type 'cd usr') and the run the RevelationTracer (type 'run revelationtracer') and wait for it to say the program is hiding itself. Once this is done, disconnect, clear your logs and reply to the email. Description: This mission is almost identical to the last one. If you still have the copy of Revelation that ARC sent you, you can proceed with the mission. Otherwise you will need to connect to Arunmor File Server and get a copy before hand. Connect to Arunmor Internal Services Machine and bypass the Monitor, Proxy and Firewall. Break the password and enter the File Server. Run your file copier on Revelation, then copy it to the File Server, then go to the Console. Enter the usr directory (type 'cd usr') and the run Revelation (type 'run revelation') and wait for the Virus to become active. You will automatically be disconnected when it does, and a red square will appear on the world map. Once this is done, disconnect, clear your logs and reply to the email. Mission Description: Copy a Database. Description: Before you connect to ARC Local Area Network, you will need to get the Voice Pattern of the ARC Admin, so go to the ARC Public Access Server to get his number, then connect and record his voice. Now, go to ARC Local Area Network, and Bypass the Monitor and Proxy. You will now need to work your way through the LAN Since the LAN is randomly generated each time, there is no set way to do this, but you should aim for the Main Server system (Refer to Section 3.1 if you need help getting through LANs). When you are in the system, enter the File Server, and at the bottom should be 9 files, 10Gq each, named ARC-Revelation x.dat. These are the files you need to copy. Copy all the files to your memory, disconnect, and clear your logs. Now, connect to the Arunmor File Server and copy all of the files onto it. If there isn't enough space, delete any useless files that may have appeared. Once you have copied all of the files, use the Decrypter on them, and then you can reply to the mail and finish the mission. If you didn't have enough memory space for all the files, you will need to make 2 trips. Required Software: Faith, Revelation Tracker, IP Lookup, Voice Analyser, Decypher, Monitor Bypass v5, Proxy Bypass v5, Firewall Bypass v5, File Copier. Description: The final Arunmor mission. There is only one way to do this one, and that is quickly. First of all, go to Arunmor's File Server, and get a copy of Faith and Revelation Tracker. Run Revelation Tracker straight away, as that will give you IP's of infected systems. Use your IP lookup to get the link from each IP, and connect to the system. Break through what ever security the system has, and enter the file server. Copy Faith to the system, then go into the console and run it. A few seconds later, Revelation should be cleared from the system. Disconnect, and continue doing the same thing until the mission is complete. You do not have time to clear your logs on this one, so make sure you have a Motion Sensor and Gateway Nuke, and that the Motion Sensor is running. HINTS: Don't bother with Banks or Central Mainframes. Leave them and let Revelation spread to a system that you can hack quicker (Internal Services). Don't waste time. Revelation only needs 2 minutes to be able to spread to 2 other systems. Disinfect a system and then move on to the next one. After you have finished the mission, keep an eye on your Motion Sensor. Since you didn't have time to cover your logs, you will be traced, so you will need to Nuke your gateway. Its also worth noting that ARC may try and frame you a while after this mission, so you should keep your eye on your motion sensor at all times, or you may well find yourself Disavowed for hacking ARC Central Mainframe when you didn't do it. You will also have a criminal record that needs clearing if this happens. On the forums, several other ways of fighting the virus have been put forward. Though I've not tested these myself, I'm told they work by others. So, here they are. 1. Instead of running faith on a system, go straight to the console, and shut the system down (by deleting the sys directory and then using the shutdown command). Revelation will still show up on the map, but when the 2 minutes pass, since the system is no longer running, the virus cannot spread and the infection will disappear. 2. When the Revelation outbreak occurs, connect to ARC Central mainframe and crash the system. This will stop the virus from spreading to other computers. You should note that people have said, using this method, that Revelation will start again when the system comes back online. This is the end of the Arunmor side of the storyline. After you have finished this mission, keep your eye on the news for the ending of the story. You will get these missions if you destroy the Arunmor Internal Services Machine using revelation when they give you the mission. Connect to Arunmor Internal Services Machine and bypass the Monitor, Proxy and Firewall. Break the password and enter the File Server. Run your file copier on Revelation, then copy it to the File Server, then go to the Console. Enter the usr directory (type 'cd usr') and the run Revelation (type 'run revelation') and wait for the Virus to become active. You will automatically be disconnected when it does, and a red square will appear on the world map. Once this is done, disconnect, clear your logs and reply to the email. Description: Before you connect to Darwin Local Area Network, you will need to get the Voice Pattern of the Darwin Admin, so go to the Darwin Public Access Server to get his number, then connect and record his voice. Now, go to Darwin Local Area Network, and Bypass the Monitor and Proxy, You will now need to work your way through the LAN Since the LAN is randomly generated each time, there is no set way to do this, but you should aim for the Main Server system (Refer to Section 3.1 if you need help getting through LANs). When you are in the system, enter the File Server, and at the bottom should be 9 files, 10Gq each names Darw-DARWIN x.dat. These are the files you need to copy. Copy all the files to your memory, disconnect, and clear your logs. Now, connect to the ARC File Server and copy all of the files onto it. If there isn't enough space, delete any useless files that may have appeared. Once you have copied all of the files, use the Decrypter on them, and then you can reply to the mail and finish the mission. If you didn't have enough memory space for all the files, you will need to make 2 trips. Description: Using only 3 or 4 bounce points (InterNIC being the first as always), connect to the bank that ARC gave you in the mission statement. Without bypassing any security, enter the password entry and attempt to break the password. Let the trace run until only 7 or 8 seconds remain, and then disconnect. Now quickly connect to InterNIC and enter the log section. Run the log modifier on the bounce log, and change the log so that the 'From' IP is the IP of the Arunmor Technical Director. As soon as you have done this, delete the Admin Access log and disconnect from InterNIC, then reply to the mail straight away (do not wait for it to appear in the news) to finish the mission. Required Software: Password Breaker, Voice Analyser, Decypher, Monitor Bypass v5, Proxy Bypass v5, Firewall Bypass v5. Description: First of all, you will need to get the link for the Arunmor Local Area Network. You can do this by hacking the Arunmor Internal Services Machine and going to the links section. Once you have done this, connect to the Arunmor Local Area Network, bypass the Monitor, Proxy and Firewall, and enter the LAN. Since LANs are randomly generated, there is no set way to do this, but if you get stuck, refer to section 3.1 for help. Once you have found your way to the main server, break through its security, enter the file server, and delete all the files there. Once you have done this, you can reply to the mission and claim your reward. Required Software: Revelation, Voice Analyser, Decypher, Monitor Bypass v5, Proxy Bypass v5, Firewall Bypass v5, File Copier. Description: The final ARC Mission. This mission is made hard by the fact not only do you have to quickly spread Revelation, but you also have Uplink planning to disavow you for working for ARC, and Faith working against you to stop Revelation, so the pressure is even higher. You should be aware that if Faith is a higher version than Revelation at this point, the mission becomes next to impossible, because it doesn't spread. Basically, you have to copy Revelation to every server you can, go to the console, and run it. Don't worry about deleting your logs, because it's game over regardless of the result. You will know when you have been successful, because Revelation will spread to your system. When you have finished the mission, you can confirm it by checking your agent status to see if you have the GrandTour badge. HINTS: Stick with the easy systems, like Internal Services to start with.